When it’s cold and dark out every morning, dragging yourself out of bed can take forever. Next thing you know, you’ve hit snooze and you’re running out the door with no time for breakfast. But we all know how important breakfast is, and without it comes low energy and a mid-morning crash after your coffee. 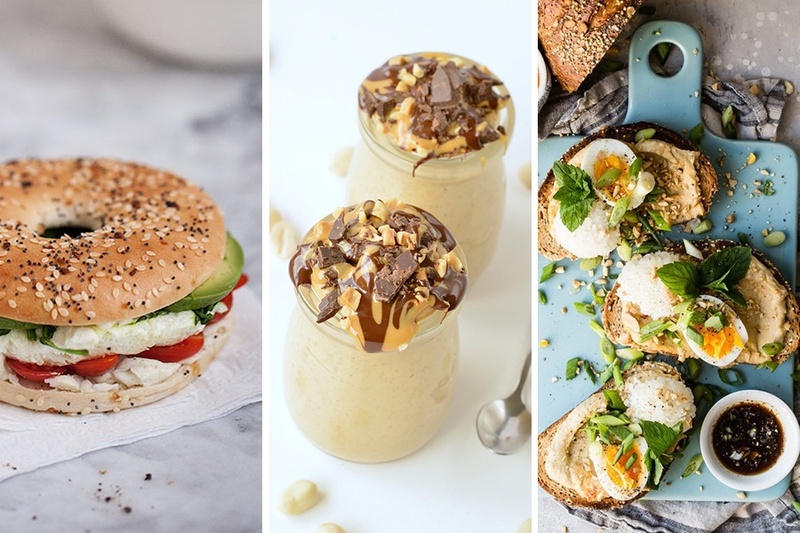 To help make your mornings easier, and allow you to sleep in and eat a nutritious breakfast, we’ve compiled a list of quick and easy breakfast recipes that you can make in under 10 minutes (did someone say avocado toast?). Many of these you can even make the night before, like overnight oats, allowing you to literally grab it and go. Greek yogurt, coconut milk, oats, and cherries mix together to form this easy overnight oats recipe. Since cherries aren’t in season right now, you can use frozen ones. Just be sure to let them thaw before adding them or there will be extra liquid in the oats. Mix up your usual avocado toast with this hummus toast, topped with hard-boiled eggs, green onions, roasted nuts, and a sprinkle of sesame oil. This could also be eaten for lunch if you’re short on time. Chia seeds, hemp seeds, and flax seeds mix with yogurt for this fiber-filled parfait. While the recipe calls for berries, you could add whatever fruit you prefer or whatever is currently in season. Swap your usual oatmeal for polenta instead. This breakfast can be made sweet or savory by adding in fruit and nuts or stirring in pesto and topping with eggs. If you workout in the morning this recipe is a great recovery meal, full of protein and carbs. Get your cinnamon roll fix without the processed sugar and simple carbs. If you don’t have a frozen banana when you make this smoothie, add a couple of ice cubes before you blend so that it’s thick and icy. Swap eggs for mashed chickpeas with spices and lemon juice in this vegan scramble. The chickpeas are cooked the same way as scrambled eggs and are complemented by mushrooms, tomatoes, and avocado. For this chia pudding to get extra creamy, blend all of the ingredients together, including the chia seeds. Try to avoid peanut butter that contains extra sugar and added oils, if possible. This easy egg sandwich can be made in the office if you don’t have time to make it at home. Simply add egg whites and spinach together in a bowl and cook in the microwave, add a couple of pieces of cheese, avocado, and tomato and you’re done. With 9 grams of fiber and 22 grams of protein, this smoothie is sure to keep you full until lunch. If you’re able to, try using vegan protein powder or one with very few additives and extra ingredients. Get your chocolate peanut butter fix with this banana, peanut butter, cacao powder, and nut milk shake. Turn your smoothie into a bowl by adding a sprinkle of granola and raw cacao nibs.